← A Yankee Way of Knowledge? Islamic fundamentalism of the jihad variety began a little more than half a century ago with Sayyid Qutb (1906-1966), the founder of the Islamic Brotherhood, which gave birth to al Qaeda. He is the author of several seminal works including Social Justice (1949) and Milestones (1964). He also is credited with a 30-volume commentary on the Qur’an called In the Shade of the Qur’an. Early in his career, he spent two years in the United States teaching college in Washington, DC; Greeley, CO; and Stanford University. The American is primitive in his artistic taste, both in what he enjoys as art and in his own artistic works. “Jazz” music is his music of choice. This is that music that the Negroes invented to satisfy their primitive inclinations, as well as their desire to be noisy on the one hand and to excite bestial tendencies on the other. The American’s intoxication in “”jazz” music does not reach its full completion until the music is accompanied by singing that is just as coarse and obnoxious as the music itself. Meanwhile, the noise of the instruments and the voices mounts, and it rings in the ears to an unbearable degree… The agitation of the multitude increases, and the voices of approval mount, and their palms ring out in vehement, continuous applause that all but deafens the ears. I wonder what he would think of Hip-Hop. He seems not to have liked African-Americans very much. In the end, I think that Qutb was not very comfortable in his own skin. For one thing, although an Egyptian, his ancestry is part Indian—and we know what happened between the Hindus and the Muslims in India and Pakistan in 1948 (Hint: widespread massacres). In the end, Gamal Abdel Nasser had him imprisoned and hanged in 1966 as a threat to the emerging Egyptian nation state. 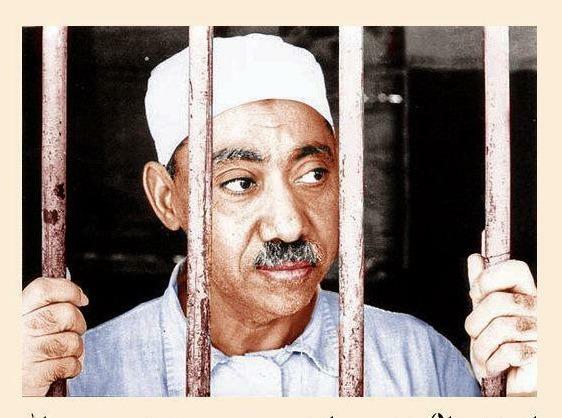 Qutb and his followers were enemies of nationalism in general and advocated an Islamic government that transcended the borders of existing nation states. Many of the Islamic terrorists of our day are inspired by entities that pay homage to Qutb, including al Qaeda and ISIS/ISIL/Daesh. This entry was posted in current-affairs and tagged islam, sayyid-qutb, terrorism. Bookmark the permalink.